The company in charge of bringing this netebook to reality is Dynamism, that delights our sight we its new Viliv S10 blade and its new 10” rotating multi-touch screen. 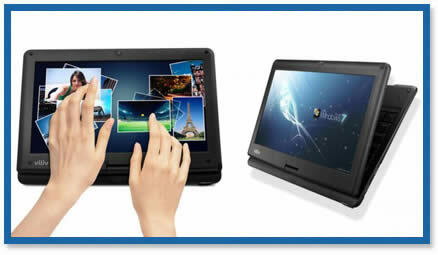 They have been talking for a while of the possibility of having multi-touch gadgets, in fact , there are already in the market a variety of telephones (and now tablets) with this characteristics, so it was the turn of the netebooks to add this longed-for function. It has been the Viliv S10 Blade the one that brought us the news. Now we only have to wait that it is available in our countries. Another prominent detail is that it is prepared for all tastes and budgets, for example, the basic version will have Windows 7 and 32 Gb of memory, and will be available for a price of US$ 699, but this price varies according to the PC and some special annexes. We can’t be sure of dates in other countries or the prices since they will certainly be increasing according to customs charges and taxes in each region.